I met a friend for breakfast at my favorite breakfasty joint last week. Breakfast is a great time for us to meet, right after school dropoff and right before the daily phone calls start coming and the work needs doing and the emails start flying and the insanity smacks us right in our “what just happened” faces. This was my first breakfast out since my healthy lifestyle resolution (day 12! ), and it took me a minute to ponder the menu–clearly, my regular choice of scrambled eggs, breakfast potatoes, and toast with butter and grape jam was out unless I started running (and ran to, say, San Diego before afternoon carpool). After ordering my coffee, I chose Swiss Oatmeal, which was a mixture of rolled oats, yogurt, a little sugar, and fruit, served cold. I said cold. As in, the oats aren’t cooked. They were soft, though, which led me to believe the mixture hadn’t just been whipped up. And gang, it was absolutely delicious. I had to learn how to make this at home, because one of the most difficult parts of reasonable eating for me is finding a breakfast that keeps me full until lunch without blowing half my daily calorie allotment. I tried a recipe I found online that involved soaking the oats in water overnight and then mixing them with the yogurt and add-ins. It was good, but not as creamy as what I had at the restaurant. And that creaminess was what I wanted. Healthy and decadent. Yes, please. Last night, I mixed my oats up with some unflavored nonfat Greek yogurt; I use Greek when possible because it is heavier and creamier than American-style yogurt, and it is packed to the gills with protein, which helps keep my tummy from yelping around 10 a.m. I stirred a little bit of lowfat milk in there, covered it up, stuck it in the fridge, and went to bed. This morning, I stirred in a touch of brown sugar and some chopped up Honeycrisp apples, and took a bite. Heaven. I, my friends, have a new favorite breakfast. And three hours later, I am not even a touch hungry. Fruit to your liking, along with cinnamon, raisins, or anything else your heart desires. 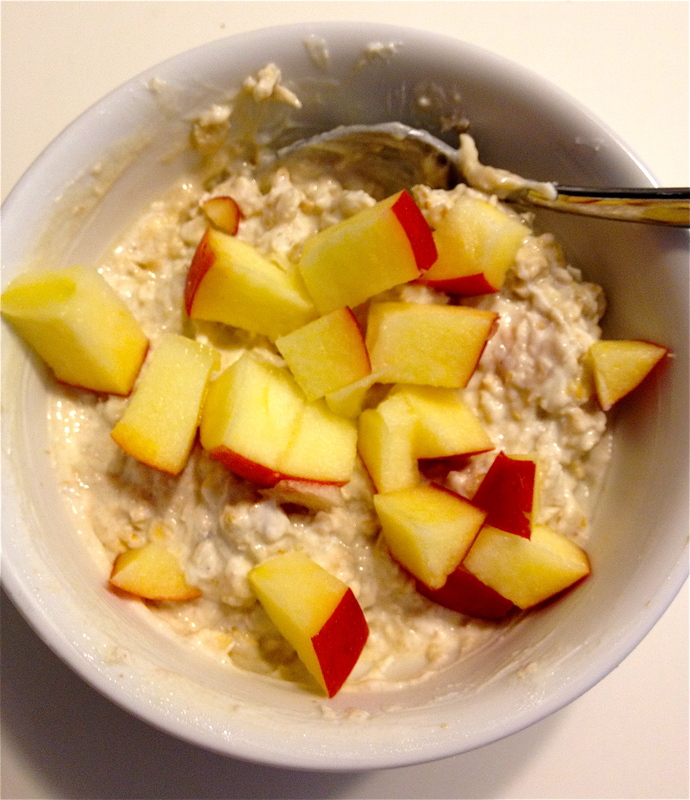 In a small bowl, mix together the oats, yogurt, and milk the night before your yummy breakfast. It’ll be thick–that’s good. Cover it with plastic wrap and tuck it into your fridge, and then head off for slumberland. In the morning, give that mixture a stir and add in your sweetener and fruit. Enjoy.